As the summer heats up, the dialogue in the first three Black Daddies Club: Breaking Bread Brunches gets more personal. Thank you to Michael Went, Nicole Angela and Belinda Ageda, who co-hosted and co-facilitated some really important and meaningful discussions in the June edition of Breaking Bread Brunch, which was focused on the “Importance of Black Space in Toronto.” Also, a deep thank you to the attendees who came out to June Edition, who broke bread with us, shared their intimate stories and collectively began thinking about strategies to move forward with for the 2017 Black Love Matters: Un-Conference. 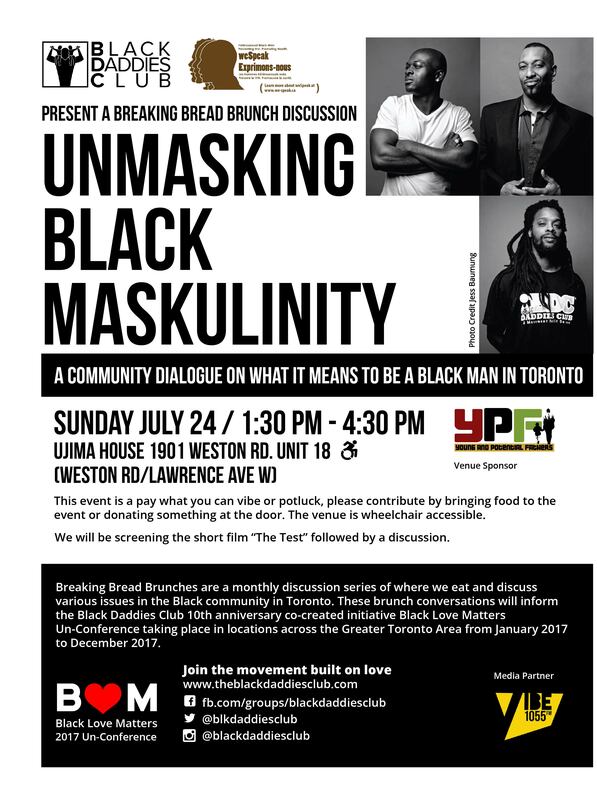 The July edition of Breaking Bread Brunch looks to maintain the richness of community dialogue as we tackle the topic of “Unmasking Black Maskulinity: What it means to be a Black man in Toronto.” Black Daddies Club has partnered with We Speak Research (http://www.we-speak.ca/) to cohost this dialogue as well as a screening of the short film, “The Test” on Sunday July 24th, 2016, from 1:30pm to 4:30pm at Ujima House (1901 Weston Road, Unit 18). This venue is wheelchair accessible. Feel free to read “I am not a dainty Black man” by Brandon Hay. This discussion is open to all genders who are interested in being apart of the dialogue regarding the lived experience of Black men in Toronto. This month’s discussion will not have a online streaming component, as we want to honour the intimacy of dialogue that we are hoping to create during this upcoming dialogue on Black masculinity. The admission for this event is pay what you can or Potluck, so if possible, please contribute by bringing food or donating something at the door. Breaking Bread Brunches are a monthly discussion series of where we eat and discuss issues in the Black community in Toronto. These brunch conversations will inform the upcoming Black Daddies Club 10th anniversary co-created initiative, Black Love Matters Un-Conference, taking place in locations across the Greater Toronto Area from January 2017 to December 2017. Looking forward to seeing you in the space and hearing your stories in the dialogue. CTV The Social discusses Black Masculinities, the Journey to Black Liberation Symposium and the Black Liberation Ball.